The new BX5 design equates to yet more quality while affordability is retained. Redesigned in and out; great-sounding mids; good for a wide range of applications. Not so hot for sub-bass. 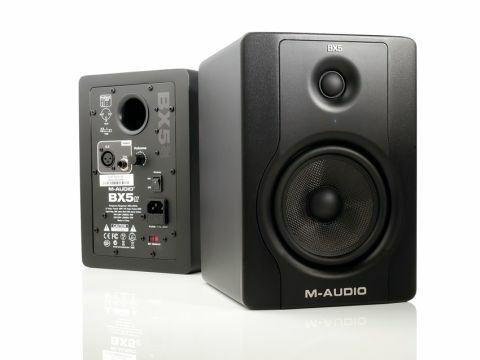 Monitors may not be the product type you most readily associate with M-Audio, so it might surprise you to discover that, according to sales reports from January 2009 to December 2010, the company's BX5 speaker was the best-selling monitor in the US. Combining high performance with compact design and affordable cost, it understandably represented a popular choice. "The standout frequency ranges are the upper mids, which tingle with clarity yet provide weighty punch." The new design comes in midnight black, with only the silver 'M-Audio' and 'BX5' badges and a tiny blue LED 'on' light between the tweeter and woofer offering any colour. Neatly, to help you position the monitors, the LED shines brightest when you're sitting on-axis from the speaker's front. Round the back, as well as the power inlet and rocker switch, you'll find both balanced XLR and balanced or unbalanced TRS inputs and a volume dial. The front face offers a new 5" Kevlar cone that provides sound from the new low-frequency driver. Upper frequencies are distributed through a 1" silk dome, with a crossover frequency between the cones at 3kHz, the net result providing 70W of power, with 40W provided by the bass driver and 30 via the tweeter. Both speaker cones are magnetically shielded and the whole bundle, while rather muted in appearance, is nevertheless attractive. In use, the BX5s are seriously impressive for a monitor this size. The standout frequency ranges are the upper mids, which tingle with clarity yet provide weighty punch, while the top end sizzles nicely without overcooking content in this area. The majority of affordable compact speakers are found wanting here but the BX5s just get on with doing their job very well, without providing ear fatigue or clatter. Inevitably for a 5" cone, the bass has to come in for some scrutiny - but a lowest frequency of 53Hz is perfectly acceptable for a monitor this size. While you'd never trust sub-bass frequencies on compact speakers, they still provide a great platform to accurately mix bass and kicks - though use a multimeter to check for bass spikes. The low mid-range is nice too and with the crossover frequency at 3kHz, there's none of the awkwardness caused by too many sounds being unnaturally split across the cones. There's a punch to the BX5s that makes them an ideal monitor for pop and dance music but they're accurate enough for intricate mixing, so I suspect they'll also find favour with those working in post-production and sound design, while they'd make an excellent choice for those putting home cinema and surround systems together too. The original BX5s have been market leaders for a fair while now but it's impressive that, rather than waiting to let rival firms make up ground, M-Audio has shaken up the range to keep it right at the front of the pack. As touched on above, if you like the idea of the BX5s but know you'll need greater bass extension, the larger BX8s have been overhauled too, with a frequency range of 38Hz to 22kHz. Don't underestimate these little brothers though - they're very impressive and offer a bargain for beginner producers or as a second pair.